This monthly series spotlights an amazing member of the team here at Neato. We take a moment to get to know the people behind the scenes, the robots and the business…Let’s meet our NEATONIANS! 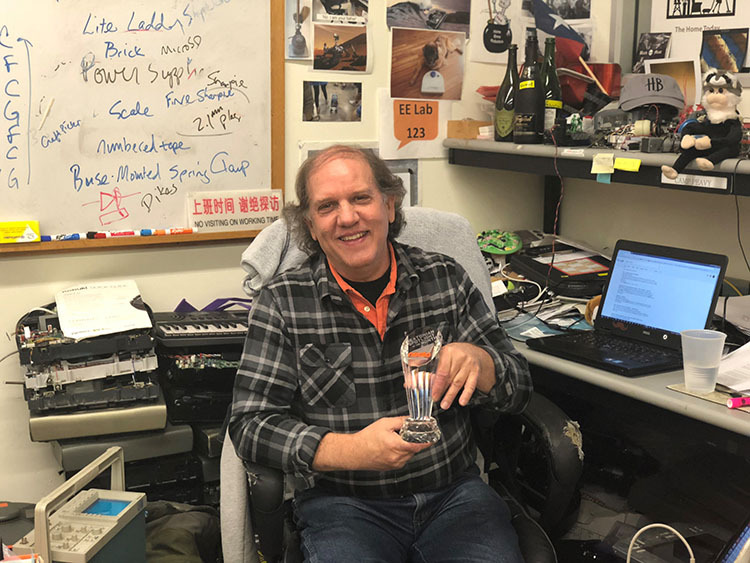 Camp Peavy is an electronics technician extraordinaire with a love for robotics, and he is one of our most tenured Neatonians. With over 11 years at Neato, Camp has seen the growth, change, and evolution of the company, but one thing hasn’t changed in those 11 years… He is just as excited to be here as he was on his first day. Camp has managed to do what some people only dream of doing, he has turned his passion into his profession. Let’s find out more about Camp! 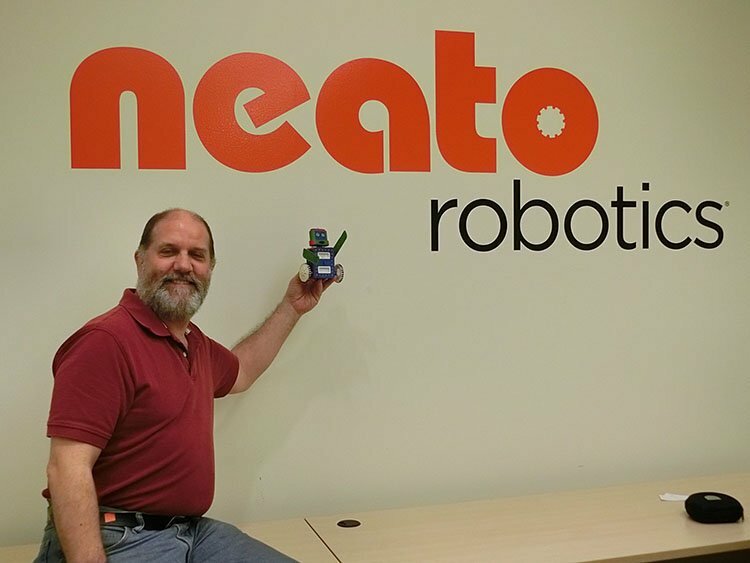 What do you do at Neato Robotics? What don’t I do? (laughs) I build robots. I have been building robots for 36 years. Robotics is an interdisciplinary activity, its mechanical hardware and software, so you pretty much have to do it all. How did you end up at Neato? My degree is in Marketing, but in 1982 I was hired on at the local Radio Shack Computer Center and wanted to take what I was doing to the nth degree, which was mobile robots, which is basically the same thing as your microcomputer but with eyes, arms, and legs. So, I took my bonus check from Radio Shack, loaded up my car, left Florida and headed to the Silicon Valley 34 years ago. 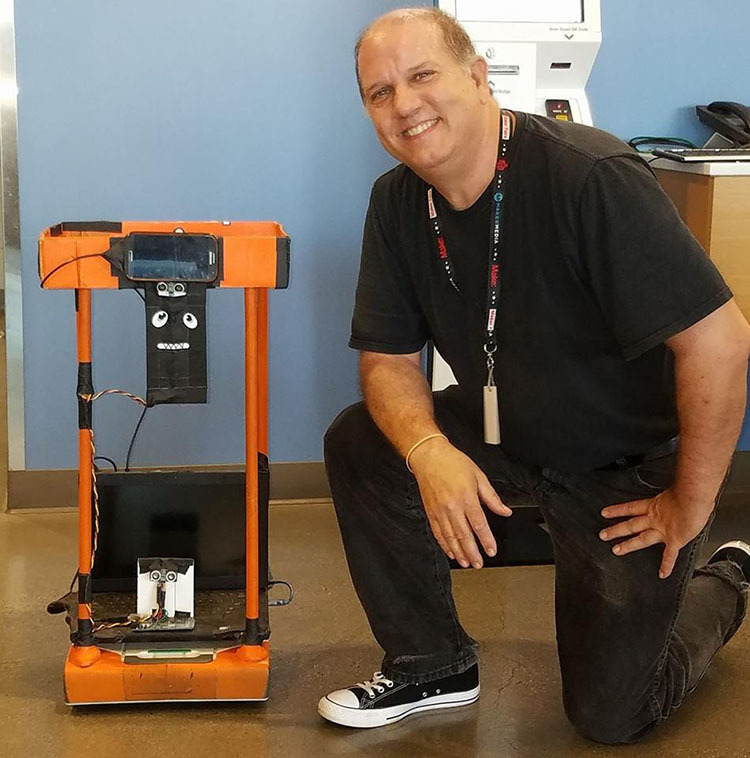 Initially, I sold electronics and computers while building robots as a hobby and was able to parlay that into being a PC tech and network administrator. Bad things happen to good people and I was laid off from my network admin job and had to decide what I wanted to do with my life. Since I had been building robots for so long I took a job as an electronics technician at Jameco Electronics (they own RobotStore.com) and I became the “Robot Guy.” At that time, Neato was right across the street from my house and they had made a pitch at the Home Brew Robotics Club for an open position for a technician, which I got, and that’s how it all began. Bad things happen to good people and I was laid off from my network admin job and had to decide what I wanted to do with my life. — On how an unexpected event led him to Neato. You are doing it right when you are getting paid to do something you love. It’s such an amazing opportunity. Again, it was long ago looking at the business and thinking ok…where will this be a long time from now and its mobile robots. In the next 10 years, we are going to see mobile robots all over the place. What we are doing is combining the mechanics of the industrial age with the electronics of the information age and we are making smart machines. Should people be nervous about the idea of robots being able to do so many things? No, not at all it a tool. It’s a tool that allows you to do your job, faster cheaper and better. There is a lot of content out there today stressing the importance of children learning the arts and focusing on creativity because they won’t necessarily need the technical skills a robot can master faster and better. Yes, you hear about STEM and STEAM. I think STEAM is very important. I consider myself an artist. I build stuff with things I find and put together and that’s the way I do it and have done it. It’s not all mathematics, there is some feeling and emotion that goes into what I do. When I started attending in the 80’s there were about 12 of us and now we have about 100 people show up. The meetings consist of the show and tell, a presentation and what we call “random access” which is where we break out into groups to have smaller discussions. It used to be that show and tell was at the end of the meeting, but now its moved to the beginning so that kids can come in and share their projects. People of all levels of robotics come and we see all types of robots. Everything from wheeled, legged, the table bot, floor bots etc. These meetings are the last Wednesday of every month. I consider myself an artist. I build stuff with things I find and put together and that’s the way I do it and have done it. I can bang out the 12 bar blues on the piano. What’s the strangest job you have ever had? I worked my way through college managing a group of high school students selling newspaper subscriptions door to door. So basically, I drove a van around while the kids hopped out and did the sales. It worked out perfectly because the commission checks were timed with tuition dues. I am not a very adventurous eater, but I have had rattlesnake, it tastes like beef. Nutella. I have recently discovered that Nutella is something that I cannot resist… You know what?… I cannot resist any type of robot event. 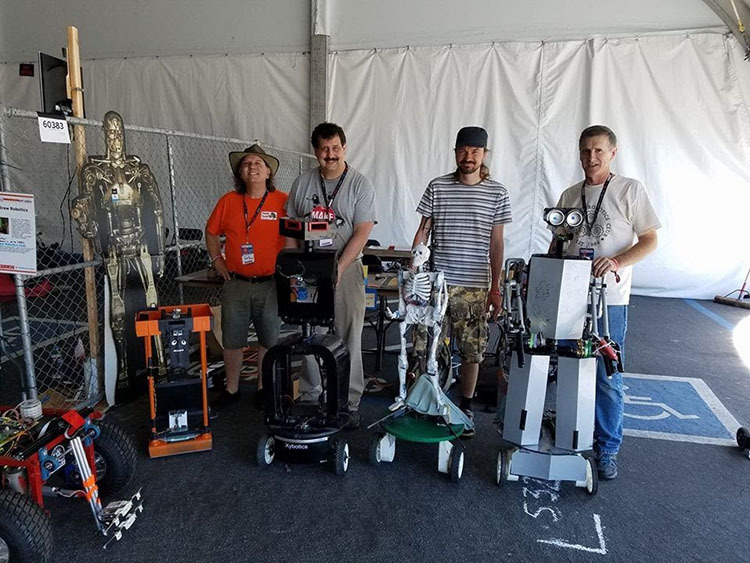 Any kind of event where the usual suspects, be it Home Brew Robotic Club or SV Robotics will be in attendance… Any time there is a robot meet up I generally can’t resist it. Orange… Neato Orange, Pantone color PMS 1655c. It’s a good color. 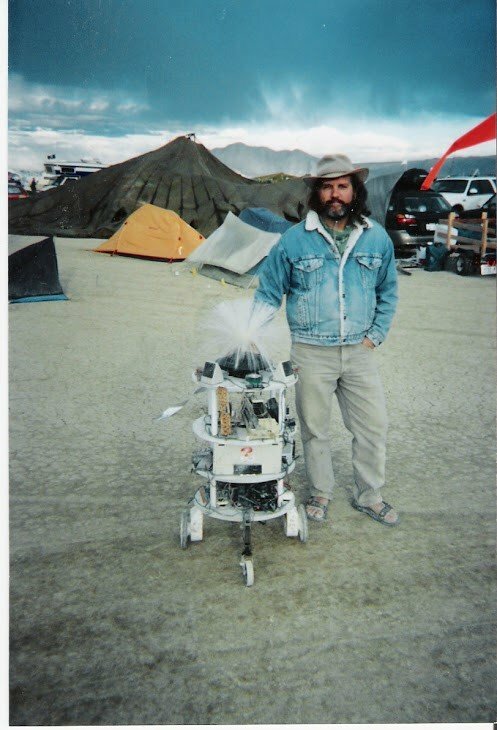 I have been to Burning Man 6 times from 1999-2005. The goal is to leave the event with a functioning robot. I have signed up to go again this year…I don’t need this, but the theme this year is “I, Robot” and I do not want to be asked why I didn’t go. Australia. You know I took a big leap moving from Florida to the Silicon Valley and I thought if I moved anywhere else it would be Australia. If Hollywood made a movie about your life, who would you like to see cast as you, and why?